For example, thanks to AGORA programme, researchers from more than 8,700 institutions in more than 115 low and middle-income eligible countries have been provided with access to the highest quality online peer-reviewed journals and e- books, in agriculture and related sciences. …delivered workshops in El Salvador, Senegal, Côte d’Ivoire, Rwanda, Liberia, Malawi in collaboration with ITOCA. The online course “Fundamentals of Information Literacy and Access to Global Online Research in Agriculture” has been delivered in English, French and Spanish. … organized workshops in Nigeria and Nepal supported by the Noric Institution of Health Science. During the month of October 2018, 266 users from registered institutions had participated the HINARI Users Online Course. … conducted ARDI trainings in The Gambia, Malawi, Rwanda and plans to deliver a workshop in Botswana in collaboration with ITOCA during the following months. ... the new Research4Life programme launched earlier this year, has started its capacity development activities. A presentation about the programme was delivered to librarians attending The Association of Caribbean University, Research and Institutional Libraries Conference (ACURIL 2018) in the Dominican Republic. Participants at a two-week training for capital defenders from Africa also learned about GOALI at an event hosted at the Cornell University Makwanyane Institute. Finally, the first GOALI basic course tutorial is now available online. The module aims to help users to search more effectively for legal books and articles in the GOALI portal. 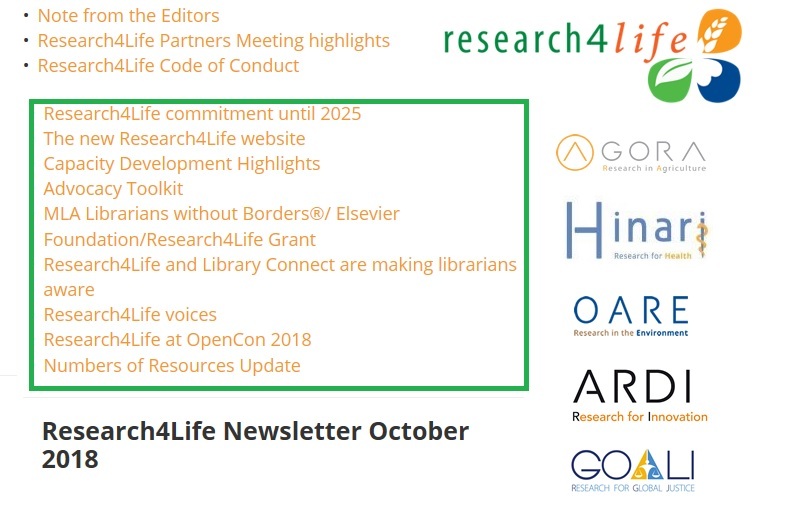 Find out more about these and other exciting Research4Life accomplishments here.